Tuesday May 1st was the first full day of the WSOP merge for Nevada and the eastern states of Delaware and New Jersey and for tournament players the results are awesome with many many more tournament options now available. Some are tournaments that I would have no interest in playing, but there are several that I definitely want to be taking part in. They have also put back less expensive tournaments for those trying to build a bankroll which I think is really great. Not everybody wants to keep hundreds of dollars online and for those players that maybe only have a hundred bucks they can get in the game with tournaments of $0.10, $0.25, $0.50, and $1 available to them. It's a whole new world, and it's more expensive. On WSOP prior to the merge my basic poker day consisted of playing four $3 deepstack rebuy tournaments a total cost for me of $24 as I do the immediate rebuy, but not the add-on, and a $5 deepstack rebuy tournament if it actually went off with a cost for me of $10. The total cost for me not including if I tossed a $20 one in here and there was $34 per day. After looking over the tournaments, and experimenting with some and then deciding whether or not to continue with them in the final analysis I have 9 tournaments a day I want to be part of my daily play schedule, but unlike the cost of $34 per day previously, the cost now for me per day will be $81. The tournaments I want to be playing are listed below. The numbers that I have separated by a slash beneath each tournament listed is the starting chip stack, how many minutes per blind as under the old system it was 10 minutes, but now some of the tournaments have only 8 minute blinds, how long the rebuy period is in minutes or if it's not a rebuy tournament how long the late registration is, and finally what is the blind structure A or B. Another thing that changed with the merge is their tournaments have one of two blind structures. Here's a screenshot of each. I will call the one on top Structure A and the one on the bottom Structure B. 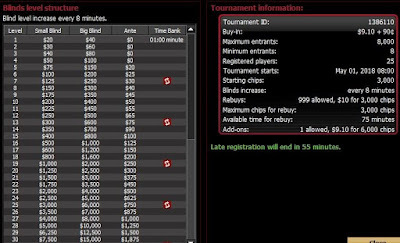 There are other tournaments such as 6-max and re-entries, which allow you to reenter the tournament if you have one chip or less, but these tournaments only start with 2500 chips and anyone that reads this blog knows that in tournament play my strength lies undoubtedly in deepstack, slow structured, full ring tournanent play. If you look at the difference between structure A and B in the screenshot above you will find that by the time level 10 is reached the blinds are double what they are in structure A and antes have kicked in five levels earlier than structure A. 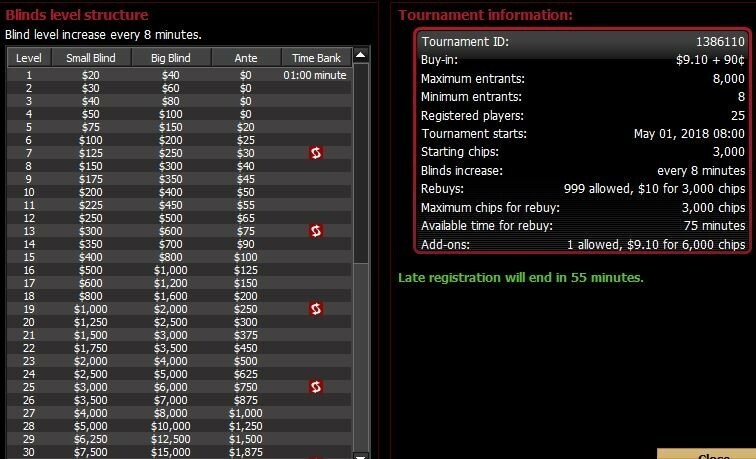 If you will notice on the list of the tournaments I want to play the ones that have structure B are the $1 tournaments, the cheaper ones and to make matters worse there also have only 8 minute blinds. So why would I even play them you might ask? Well, actually there are a few reasons. The first is two of those are $500 guarantees and a simple $2 investment can pay out over $130 if you take it down. The second reason is they are also just a smidgen closer to the tournament structures I will find playing live. No, I am not saying they are close to it, but they are at the very least closer. That might be a stretch to use that as a reason, but none the less it is a factual one. The third reason is it helps to keep down my average buyin also known as the ABI. Along with this more expensive cost it's going to require an updated bankroll management approach. I went into today with a bankroll of $729 and $81 a day could be a bit expensive. If you look online looking for bankroll management suggestions some will say 100 ABIs as the suggestion, but on a scale of 1 to 10 with 10 being ultra-conservative and 1 being Ultra crazy on the risk assessment scale, the train of thought seems to be that a 100 ABI bankroll is around 4 to 6 on that scale right smack-dab in the middle. I make no secret of my financial situation which is that although I have $300 left available to me each month after bills are paid and expenses are set aside such as food and whatnot, a portion of that remaining $300 has to be delegated for Uber or Lyft rides if needed, or perhaps I may want a simple food delivery order once or twice during the months, or I may want to keep $100 aside for an emergency fund just in case something comes up like the other day when I lost my vape pen and had to go to the vape store and spend $40 for a new one. We never know what little thing might come up from day to day so it's always best to keep an emergency fund set aside even if it is only $100. So while if I did nothing else I could replace $300 of my bankroll if absolutely needed I don't want to put myself in that position so a safe bankroll management plan needs to be established, but one that still allows me to play the higher-priced better-paying tournaments and I think I'm came up with one that I'm pleased and satisfied with. I needed to decide on a base bankroll amount that allows me to play what I call my Mainframe 6. For me this would be the two $5 deepstack rebuys, the $3 deepstack rebuy, and the three $1 tournaments. That's a total of $32 divided by 6 tournaments which equals a ABI or average buyin of $5.33. The base bankroll I want for these is $700 which gives me 131 average buyins in the bankroll and overall 70 buyins for the highest priced tournament that I would be playing each day. I find this to be a nice middle ground. Even if the bankroll drops below $700 I still will play the Mainframe 6 until I'm back over $700 again or I'm broke. At the beginning of each poker day anything over $700 is set to one side so to speak and whatever that amount is I then decide what will be played with what is available. The choices being the $20 freezeout, the $7 deepstack rebuy $1,500 Gtd, and the $15 Daily KO. If I have $49 available as in I started the day with $749 then awesome no problem I can play all three and if I start the poker day with less such as going into today I started with $729 then choices have to be made and I have to pick and choose what I feel is best. So starting today with $729 I had $29 available and I chose the $7 deepstack rebuy with a total cost of $14 and the $15 KO. That's going to wrap this entry up. My next entry will let you know how the first 10 days went, but if the first six is any indication it is not going to be a pretty sight. You can follow along how I'm doing over on the right side of this blog, but it is loaded with a lot of red numbers unfortunately, but we keep fighting on because cold runs don't last forever they just seem like they do. So until next time take care everyone and I'll see you at the tables.